Description: Falcons are swift, powerful and agile birds of prey, known for their diving abilities. Their streamlined shape includes long, pointed wings and long narrow tails. 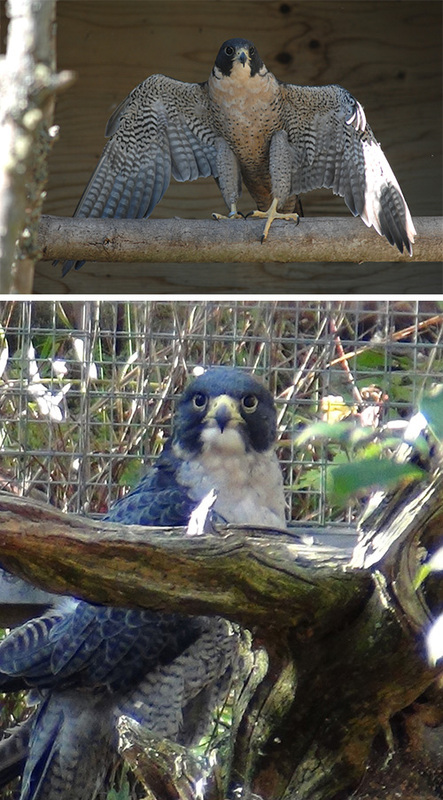 In Nova Scotia, there are 3 members of the falcon family: American kestrel, merlin and the rare peregrine falcon. 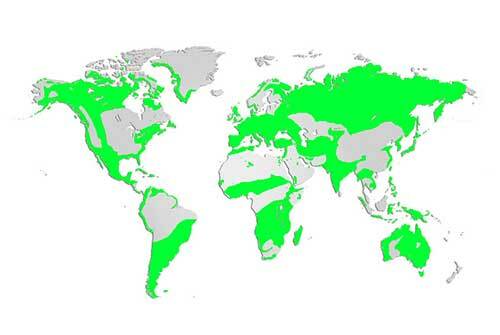 Distribution and Habitat: Peregrine falcons breed in most regions from Alaska to South America and Norway to Australia. In fact, “peregrine” means “wanderer” or “pilgrim”. They typically nest on cliff ledges near water and an abundant source of prey. They hunt over open habitats like ocean coasts, fields, mudflats, and rivers and are also at home in urban environments using skyscrapers to nest instead of cliffs. In North America they can be found along both the east and west coasts. In Nova Scotia a small population can be found along the coast of the Bay of Fundy. Diet: Carnivores, feeding mostly on other birds. Peregrine falcons typically prey on seabirds, shorebirds and songbirds, particularly ducks, gulls and pigeons. They eat a large variety of birds and have been seen taking birds as large as the sandhill crane and as small as the hummingbird. They will also kill bats and steal fish and rodents killed by other birds of prey. One of the peregrine falcon’s hunting techniques it to strike the prey so powerfully with their large, taloned feet that the prey is killed instantly in the air. Life Cycle: Each mating season, males select a few cliff ledges and the female then chooses from those. They then dig out a hollow in the rocks, gravel and soil to keep their eggs from rolling off the cliff. A clutch of 2-4 eggs is incubated for 29-32 days. The young are born helpless but are ready to leave the nest after 35-45 days. Adaptations: Peregrine falcons are the fastest creature in the world (the cheetah is the fastest land animal). They can stoop (dive) at over 350 km/hr (217 mph) though their average flight speed is much slower than that. Did you know? In the mid 1960's, peregrine falcon populations were virtually wiped out in eastern North America by the effects of pesticides, especially DDT. They are designated as a species at risk in Canada and are fully protected. Reintroduction of captive peregrine nestlings was started in the Maritimes in 1982. Birds are now nesting in New Brunswick and Nova Scotia; however, they migrate south and may be exposed to pesticides in Latin American countries where they winter. The birds of prey in the Park have been injured and cannot be returned to their natural habitat.